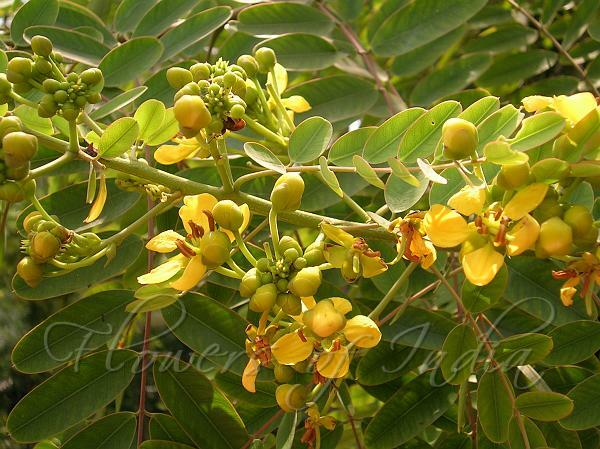 Siamese Cassia is a small to medium sized tree, up to 15-20 m tall, with a short bole and low branching high crown. Leaves pinnate, alternate, rachis 25-30 cm long, with a marked furrow, 8-13 pairs of leaflets of different size. Leaflets oblong, rounded at the base and at the apex, slightly retuse. Upper side dark green and shining, underside dull-green, shortly haired. Flowers yellow, up to 3.5 cm long, in dense racemes at the end of the shoots, and in their axils. 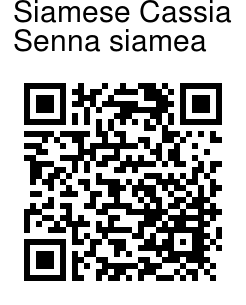 Racemes 15-30 cm long. Glabrous, brown, slightly curved pods in dense clusters, up to 25 cm long with ca 20 seeds in each. Originates in India, Burma, Sri Lanka, Indonesia and Malaysia. Today pantropical in semi-arid and subhumid tropics. Propagation by seeds, stumps and nursery-grown seedlings. Photographed in Pragati Maidan, New Delhi.